The 6-inch phone is designed with performance in mind for keen mobile gamers, boasting the “world’s fastest speed-binned 2.96GHz octa-core” processor, 8 GB of RAM and a Qualcomm AdrenoTM 630 GPU. The power is sustained by the GameCool cooling system and a fully detachable cooler accessory to keep the phone (and your palms) at a steady temperature during a high-performance mobile gaming session. 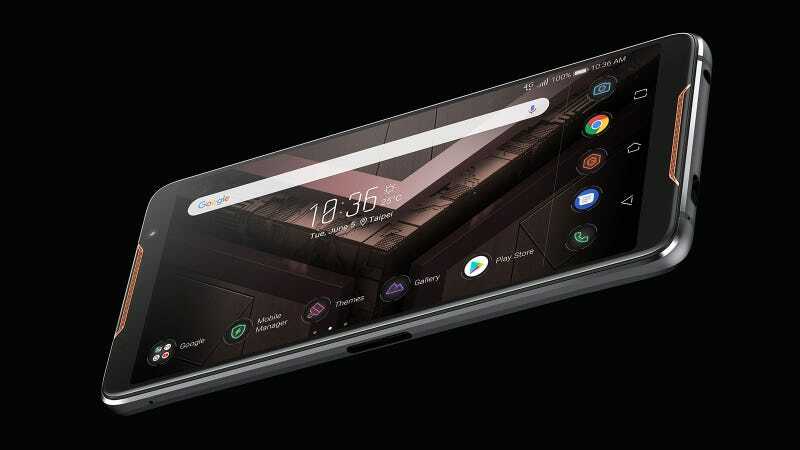 Sporting a 6-inch 90Hz AMOLED screen and a glowing ROG logo with customizable lighting in the back, this upcoming phone has the highlight features from its predecessors covered, and Asus didn’t stop there. The company crammed in vapor-chamber cooling (a feature normally reserved for gaming laptops), three USB-C ports (more on those later), and special touch-sensitive sides that can function as shoulder buttons while in landscape mode, or used to turn on the phone’s gaming mode by simply squeezing the device. On the inside, Asus blew out the device’s specs with 8GB of RAM, up to 512GB of storage, a big ‘ole 4,000 mAH battery, and an overclocked Snapdragon 845 chip that can hit 2.96Ghz instead of Qualcomm’s usual 2.8Ghz max. The ROG Phone even supports 802.11 WiGig connectivity, so you can stream gameplay wirelessly to a nearby TV or monitor using Asus’ companion WiGig Dock. In short, the ROG Phone might just be the most powerful Android phone on the planet. Now back to those extra USB-C ports. When looking at the phone in portrait mode, there’s one USB-C port (and a handy headphone jack) down at the bottom for typical stuff like charging and data transfer. But then on the sides of the device, there are two more USB-C ports so that when you’re gaming, you can hold the phone in landscape mode and still have somewhere to plug in a power cable without messing up your grip. I’m a big fan of the idea, because in a world where a lot of mainstream phone makers are ditching the headphone jack, putting two or more USB-C ports on the device is a simple and also utilitarian way of letting people connect multiple accessories so you can do things like recharge your device and use headphones at the same time. And for the ROG Phone, Asus has even more ambitious things in mind for use with USB-C. In addition to Asus’ WiGig Dock mentioned above, which features a boatload of ports and lets you turn the phone into a desktop of sorts similar to a Samsung Dex, Asus has created three more gaming add-ons for the ROG Phone. The first is a cooling dock with a built-in fan that attaches to the bottom and back of the phone to help keep your hands dry and temps down even during the most intense mobile gaming sessions. Then there’s a pair of gamepads that slip onto either side of the phone and turn the device into something like a mini Nintendo Switch. But the thing I want to try the most is Asus’ TwinView Dock, which adds extra battery capacity and an entire second screen to the ROG Phone.